Nowadays, choosing a good web host is a lot like looking for a needle in a haystack. You may wonder why this is the case when there are thousands of web hosting companies out there. It wouldn’t be that difficult, right? Well, it would have been easy if only all web hosts have your best interest in mind. The real problem here is that many of these web hosts are only after your hard-earned cash! They’d promise you with “quality” hosting service at an affordable price but the moment you click that “Buy” button, you’ll be left with a sub-par hosting package that won’t even let you build a simple website! So how can you separate the good eggs from the bad ones? One such web host that’s been gaining traction lately is Globat. You read that right – it’s Globat with a “t”! But it’s not the slightly unorthodox company name that made them popular among site owners and webmasters, they’ve actually made a name for themselves by offering quality web hosting solutions to a large number of customers worldwide. But hey, don’t just take my word for it! In this Globat in-depth review, we’re going to find out whether or not you should join their web hosting revolution. What you need to keep in mind, though, is that I’m not here to just rave about this hosting company. I’m here to uncover the secret to Globat’s success and if possible, reveal some of their dirtiest secrets (if any! ), too! So rest assured that this review will only be based on the truth – nothing else. Now on to the nitty-gritty details! 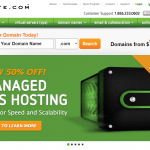 Globat Web Hosting – What’s Their Story? 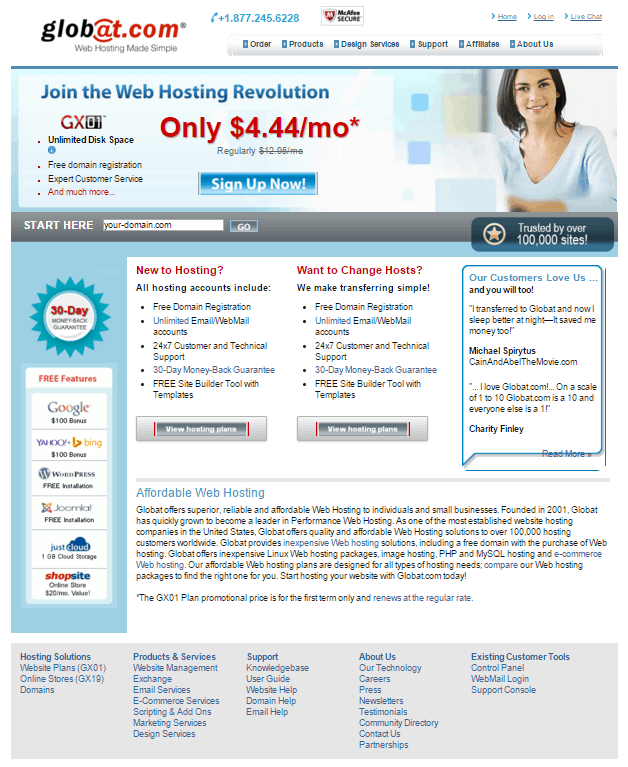 Globat, LLC was founded in 2002 in Los Angeles, CA and is one of the most established web hosting companies in the US. The company is dedicated to providing quality hosting solutions through technical expertise and dedication to providing top-notch customer service. Since its inception, the company has grown through leaps and bounds; becoming a name to reckon with in the web hosting industry. Globat claims to be an industry-leading innovator, and for a good reason. The company focuses on making web hosting accessible to everyone, regardless of the level of technical competence. They’re one of the first companies to offer high-value hosting packages at budget-friendly costs. They mainly cater to individuals, as well as small and mid-sized businesses and organizations. With over 100,000 customers, Globat has proven that they’re here to stay. Globat is an industry trend-setter, with award-winning products from its Terabyte line of web hosting packages. They offer unlimited web hosting and extensive amount of services which include, but are not limited to domain registration and web design services. Globat focus on providing shared hosting services which are mainly for those who are on a budget and just want to build simple websites. They currently offer 2 hosting packages for their shared hosting service, along with a number of different services to help you develop a site, including domain name registration and website design. These hosting plans are on the Linux platform, which is the most popular OS for web hosting. Unfortunately, Globat does not offer support for the Windows OS so if you’re looking to build a website and you need to use a specific application that’s only supported on the Windows platform (i.e. ASP.NET), then Globat isn’t the right option for you. Globat offers 2 shared hosting plans, namely GX01 and GX19. The company strives to provide better hosting services to their clients and at the time of writing, both of these plans already come with unlimited disk space and bandwidth. This means that your website can be as large and can consist of as many web pahes as you want. With unlimited bandwidth, you can be assured that your site loads fast, regardless of the number of visitors flocking to your site. Besides these, Globat even allow you to host unlimited websites with these plans. Control Panel. With a user-friendly web-based interface, you can easily create and manage a website. Website Builder. With WebSite Creator by CM4all, you can easily create a professional-looking website in just minutes. It even comes packed with tons of beautiful templates to give your site a unique look! WebMail. With this application, you can check your emails from any computer in the world, as long as you’re connected to the Internet. Gallery 2. This application allows you to quickly and easily shared your photos with family, friends, and with the rest of the world. This ever-popular CMS and blogging platform lets you install your own blog or website, with just a simple click. Mambo Content Management. This industry-leading CMS allows you to organize and create a dynamic and content-driven website. RealAudio & RealVideo Streaming. Stream your audio or video files with ease and convenience via your hosting account and take advantage of one of the most popular media formats in the industry. QuickTime Streaming. Share your .mov video files online with this popular and easy-to-use media streaming application. The low-tier plan, GX01, starts from $4.44 a month (if you go for the annual plan). 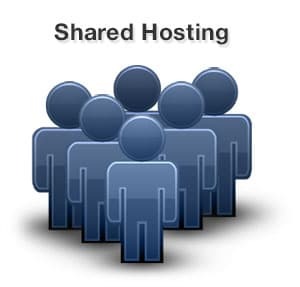 It’s simply a basic shared hosting plan where you can take advantage of unlimited disk space and bandwidth, 1 FREE domain name registration, unlimited email accounts, free website builder and templates, and 50 MySQL databases. Perhaps the only disappointing thing about this plan is that it doesn’t support international domains or sub-domains. What’s more, it caps MySQL databases at just 50. This doesn’t mean, however, that the GX01 plan doesn’t give value for money because at just $4.44 a month, you’ll get all the necessary tools and services you need to build a simple website for personal or commercial purposes. The second plan, GX19, has a price tag of $19.99 per month (for an annual plan). I originally thought it’s a VPS plan due to the considerably higher price, but as it turns out it’s just a beefed up shared hosting plan that offers a lot of extra features. It builds upon the GX01 plan, except that it provides unlimited MySQL databases and unlimited amount of domain names. As you can see, the difference between this plan and the GX01 plan is that it comes with a more feature-packed control panel, a better shopping cart software, and a one-click installer for adding applications to your site. With these features, the GX19 plan is suitable for those who want to build an eCommerce website. But for a shared hosting plan, it really is on the higher end of the spectrum in terms of pricing and I’m not completely sold on the price. In fact, I could easily get a VPS plan for the same price! From the looks of it, you’ll get all the basic hosting fundamentals such as ample amount of disk space and bandwidth, a workable control panel, a website builder, and even a file manager to conveniently manage all the files you upload to your site. And if you’re planning to build an online store, you’re also provided with shopping carts and a shared SSL certificate to protect your customers’ private information. Still, this doesn’t deny the fact that Globat lacks many of the key features that appeal to many users. For example, you can’t create custom cron jobs and there’s a lack of a script library where you can access applications and scripts to install on your website. What’s more, the website statistics tool is very basic and provides very limited information on your site’s traffic. If you think Globat don’t have what you need in a web host, consider checking out other great alternative, including: BlueHost, eHost, iPage. Blogs have become today’s medium of choice for online communication, particularly among creative professionals, organizations, and families. Blogs quickly rose to popularity because of the ease in which they’re changed or updated, as well as their ability to create interaction between the author and the readers. Globat’s shared hosting plans come packed with the user-friendly WordPress blog. 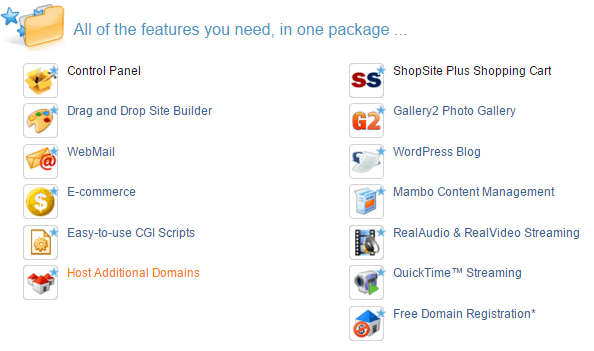 Through InstallCentral, you can quickly install the WordPress application on your site. In fact, you can build an entire website around your blog, along with the great features that come with this powerful and ever-popular blogging platform. Create matching web pages, along with journal entries i.e. About Me, My Resume, etc. Access to thousands of free plugins and themes available from the WordPress site to further expand your WordPress site’s functionality and give it a standout look. If you find this option a bit of a hassle, Globat also gives you another option to add WordPress to your hosting platform. With their premium WordPress hosting plans, you’ll get a more optimized and hassle-free WordPress experience. You can choose between two plans: WP Starter and WP Essential. Take note, however, that the premium WordPress hosting option is an add-on service, which means you must first purchase any of Globat’s shared hosting plans before you can use this product. A custom-made control panel that lets you quickly and easily access your favorite WordPress tools. Access to a library of carefully chosen WordPress themes to spruce up your site. Pre-installed WordPress plugins to further expand and enhance your site’s functionality. If you think you can handle manually installing the WordPress application yourself, I suggest you stick with the first option. The second option, which is to purchase premium WordPress hosting, comes at an additional cost and is only ideal for those who are either new to WordPress hosting or need a more powerful hosting solution to support their growing WordPress site. Are you all set to starting selling your awesome products online? Globat, like many web hosting providers, provide all sorts of eCommerce tools and services to help you kick-start your online store. Both the GX01 and GX19 plans allow you to choose from a number of shopping cart software, including ShopSite, AgoraCart, osCommerce, and the PayPal Shopping Cart. 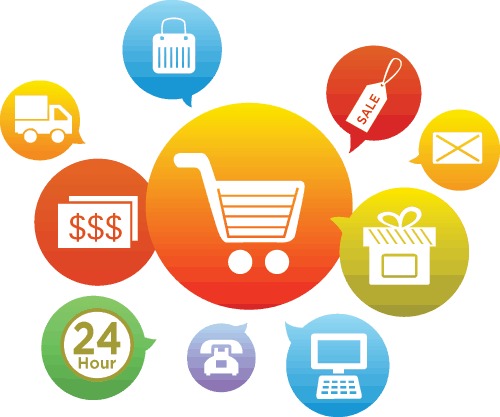 With a shopping cart software, you can add a product search to your eCommerce site and put your products on sale. Your customers can easily add products to a virtual shopping cart too, and make the checkout process a lot more convenient. Likewise, accepting payments from your customers is easy, as Globat allow you to process credit card and other forms of payment with a payment gateway. Through PayPal, you can easily and securely receive credit and debit card payments, as well as bank account payments. You can also accept payments via PaymentSphere and get excellent rates and fast deposits. You can use it with your shopping cart or you can opt to scan cards directly with a smartphone. Globat also provide a shared SSL certificate on all their hosting plans but if you don’t want to share it with all users on the server, you can opt for a dedicated SSL Certificate and choose between a Positive SSL Certificate and an Extended Validation SSL Certificate. Take note, however, that this will require you to pay an additional cost. Besides the one I’ve mentioned above, Globat offer many other eCommerce tools and services, some of which require you to pay an extra cost. For example, you can also have access to a popular product sourcing market called Doba, where you can find more than 1.5 million products that you can sell on your eCommerce site. The great thing about Doba is that you no longer have to worry about shipping or managing the inventory. Simply choose the products to sell, and the suppliers will handle the rest. It’s eCommerce made easier! Globat used to offer the Plesk control panel to their clients but in 2004, they launched their very own custom control panel called “The Global Command Console”. It’s an online control panel that’s specifically designed for their hosting platform. It claims to be fast, streamlined, and user-friendly; and offers just enough to be “commanding” by providing standard features and tools for managing your account. The interface graphic is simple (if not too simple) and is very different from Plesk. If you’re already familiar with Plesk or the more popular cPanel control panel, this might take some getting used to but once you learn the ropes, it’ll be smooth-sailing. With The Global Command Console, you can set up and subsequently update and configure your website according to your preferences. Hosting services, websites, FTP accounts, domains, and emails can easily be accessed through the control panel. It also gives you access to some useful site marketing tools and resources that are ideal for newbies, like a search engine submission tool. Globat took this bold step to create proprietary software like The Global Command Console so that they can easily upgrade and expand it at will. This means that clients will get a fully customized experience unlike any on the market. The problem with a custom control panel, however, is that you cannot transfer it to a different web host should you decide to cancel your account with Globat. This is unlike cPanel and Plesk, which are popular control panels that you can transfer to various web hosts. For beginners, Globat provide a flash tutorial and a highly informative FAQs section where you can find guides on how to use the control panel. Globat don’t offer any uptime guarantee nor is there any information or statistics regarding their server’s uptime. I scoured through their site for about 10 minutes and there really wasn’t any mention of it. If you’re going to be paying $14.44 or more per month for a shared hosting plan, don’t you think it’s important to have an assurance that your site will be up 99.9% of the time, or as close to it as possible? So what can clients expect from a web host that doesn’t provide any uptime guarantee? 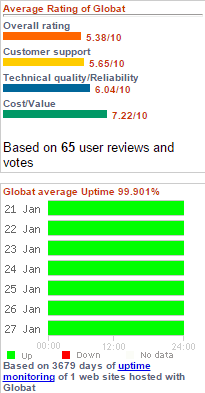 I went ahead and did some research, and eventually found a solid uptime track record for Globat. According to BestHostRatings, the overall uptime for Global is 99.91%, based on a 3,682-day server monitoring. This is an excellent record but still, it would have been better if the folks at Globat provide an uptime guarantee for the clients’ peace of mind, right? According to the company info, Globat utilize two data centers located in Boston, MA. This 2400 square feet of space is comprised of thousands of servers and a several Petabytes of storage. Each of these data centers comes equipped with around-the-clock security, runs on N+1 power (A/C and D/C), with the same network architecture and equipment. The solid network infrastructure boasts a pooled server environment, giving virtually every server in their network the ability to access website files upon request. Therefore, the first machine available will be the one to server a client’s web pages, giving hosted sites faster loading times and fewer outages than standard hosting infrastructures. Website data is parsed by Globat’s load balancers and is managed by state-of-the-art servers which are split into application pools (FTP, incoming mail, Web, etc.). This architecture allows them to configure each machine to the service it performs, which means there’s more density per box, which in turn delivers faster and more reliable hosting services. There’s no pool that live entirely in a single rack so even the loss of a rack’s switch or its power won’t take that service pool down. Like most web hosting providers, Globat is confident that you’ll be happy with their hosting services. But just because they believe in the quality of their services doesn’t mean you’re completely sold, which is why they’re offering a 30-day money-back guarantee so you can try them out completely risk-free. So go ahead and give them a shot and if they don’t meet all of your hosting needs, you can simple cancel your plan within the initial 30 days of service and you can ask for a full refund of your hosting fees. Requests for these refunds will be made through Globat’s customer support team. Take note, however, that this 30-day money-back guarantee does not include domain registrations fees or setup fees, nor will it cover any fees for add-on services you’ve purchased. If your plan does include a free domain name and you wish to cancel within the first 30 days, you’ll be charged with a fee and any applicable taxes, which will be deducted from your refund. If you don’t wish to keep this domain name, Globat have the right to take possession of it and the fee will not be charged. Additionally, the 30-day money-back guarantee only applies to credit card payments. This is due to the costs associated with processing payment made through other methods. With Globat, the shortest available billing cycle is 12 months. Therefore, if you’re to cancel your hosting account after the first 30 days of service, you’d lose the rest of the year worth of hosting that you’re forced to pay upfront. Worse still, you’ll be charged a rather hefty $150 “Breach of Contract” fee, which for me is quite ridiculous. So if you choose the less expensive hosting plan for one year, you’d get to save more by waiting until the billing cycle runs out than if you cancel it. That’s right, you’ll be stuck with them for a full year! Most web hosts these days offer a minimum of three to six months for billing, but Globat will lock you in for at least a year! Globat offers plenty of ways for you to reach their customer support team. You can contact them through toll-free telephone number, email, or via live chat. However, their customer service isn’t exactly the best you’ll find in the industry. I had a hard time looking for their toll-free phone number since it’s not highly visible throughout their site, unless you stumble upon their customer support page. If you fail to find this toll-free number, you’ll be forced to dial their local number that’s found at the top of their homepage (which is actually the number they want you to call). I tried to get in touch with a customer rep via telephone and I discovered that it’s available from 6AM to 6PM (Pacific Time), 7 days a week. This is pretty good since you can reach them anytime, even on weekends. The average wait time was 8 minutes, which isn’t exactly the longest response time I’ve experienced. I was greeted by a professional voice recording which identified the company as I was then provided with menu options. I chose technical support and was notified that I was first in line in the waiting queue. It took another 3 minutes before I was finally connected with a live rep who was quite friendly and professional, and easily understood my questions. I got prompt answers from the rep and he didn’t put me on hold. Overall, I was pleased with their phone support because I didn’t have to wait for a long time and the rep was knowledgeable. I couldn’t say the same for their live chat, though. I tested it out at around 11PM on a Thursday. I visited their site and clicked on the live chat icon, which was supposed to be available 24/7. However, it turned out that the operators were offline. I tried again at 7AM the following day and saw that an operator is finally online and available to address my issue. I filled in their forms and submitted it before I was able to talk to a live customer rep. But while I was filling out the forms, I noticed that the rep is offline again and must have his/her post because I received the same message as before. This doesn’t happen a lot and 24/7 support is not supposed to allow unavailability at all times. In the end, I had to give up and just move on to the next method, which is to send an email. I sent an email at 3AM on a Saturday. It took about 2 days before I got to receive a response from Globat. I was able to get the answers I need, but the response time was a bit lengthy. Some web hosts would usually respond after 5 to 8 hours. I have to say that even though Globat promised to provide 24/7 customer support, they’re not really accessible around the clock. Your best option would be to contact them through live chat, which is pretty good for when you’re in an emergency and require immediate help. 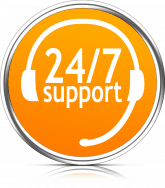 However, it’s not as good as the ones you’ll experience with other web hosts like BlueHost and iPage, which provide true 24/7 customer support via phone, live chat, and email. For quick answers to common problems, it’s good to know that Globat has a comprehensive knowledgebase and lots of user guides with dozens of video tutorials. These tutorials will show you exactly how to execute certain tasks or use a particular feature. An online forum would have been a nice addition too but unfortunately, Globat currently do not have a forum where clients can meet and discuss about various aspects of the company’s hosting service. When it comes to purchasing a product, the general rule of thumb is that “the benefits must outweigh the disadvantages”. I constantly remind myself with this one rule whenever I search for the ideal web host. I always make sure that I’ll make a deal with a company that can truly help me grow my business and give value for money. After all, money doesn’t grow on trees! Now, it’s up to you to decide whether or not Globat is the ideal hosting provider for you. Globat is a fairly decent web host for individuals and small businesses on a budget. For the most part, their service’s features and interface are user-friendly and easy to grasp. Their hosting plans provide all the necessary features for building a simple and workable website. However, the functionality is watered down and comes at the cost of ease of use. I was quite pleased with their phone support, though I was gravely disappointed with their live chat and email support. The company has received several complaints about their customer support which they should address as soon as possible, lest they want to lose customers. Globat remains to have a large customer base in the US and abroad, and they’ve proven that they’re here to stay. They may not be as powerful as other leading brands but they continue to expand their hosting packages’ offerings. Hopefully, they’ll also improve their customer service. This web host is likely a good candidate for those who are somewhat new to the hosting industry and creating a website. Though not extremely powerful, they’re good enough to allow you to build a simple yet functional website for personal or commercial purposes. Their service, however, isn’t for the most demanding of customers. So if you’re expecting high-traffic volumes to your site and you need a more robust hosting package, it’s best to just look for another web host that does offer more flexible and scalable hosting options. Globat is far from the best web hosting provider but they do provide reliable basic hosting that’s appropriate for beginners.